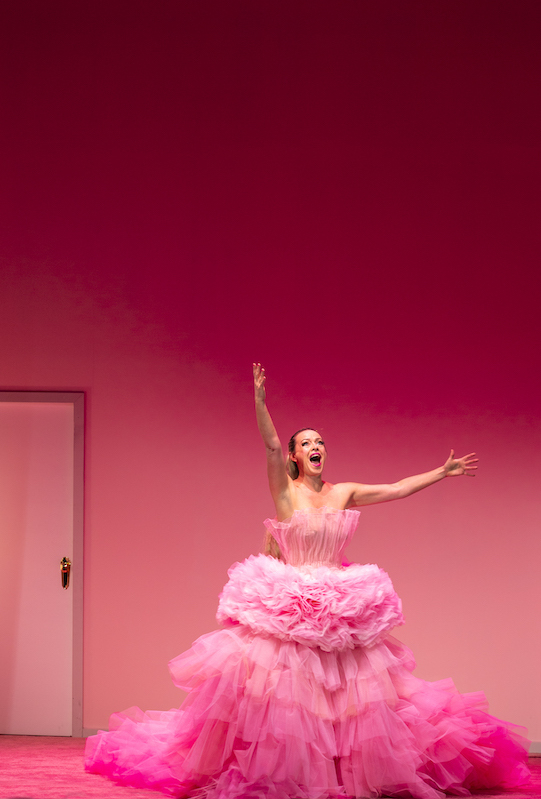 While opera companies the world over struggle to rarely, if ever, include female directors or conductors, let alone composers, Victorian Opera calmly and capably includes all three in Lorelei. The success of the unique work is inextricably linked to its cast of three very special female artists, the end result reaching a dreamy nirvana that is best experienced in person. Described as an operatic cabaret, the crossover composition is by three artists, with Julian Langdon, Casey Bennetto and Gillian Cosgriff writing the sumptuous music, and Casey Bennetto and Gillian Cosgriff penning the inventive lyrics. 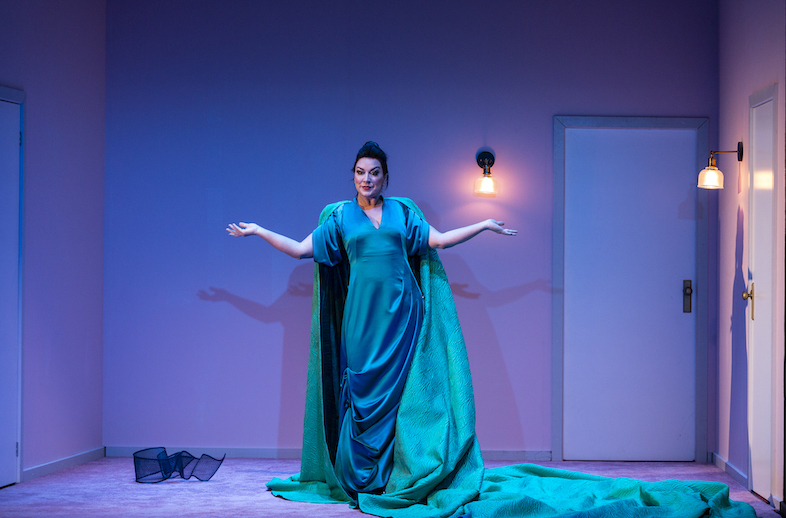 Working from a concept by Ali McGregor, the writers have explored the mythical figure of Lorelei using a present day lens of the blaming and shaming of women, a practice that is particularly prevalent in the storylines of operas. The music of Lorelei is melodious and instantly accessible, a fascinating blend of styles and rhythms. Langdon’s superb orchestrations are a key feature of the composition. Musical director Phoebe Briggs leads the 12 musicians of the Victorian Opera Chamber Orchestra in what is clearly a meticulously rehearsed performance of the new work. With a third of the pit occupied by percussion, musicians Arwen Johnston and Kaylie Melville are kept busy providing all manner of percussive rhythm and effects. As seen in the stunning images accompanying this review, the production values of Lorelei are high. 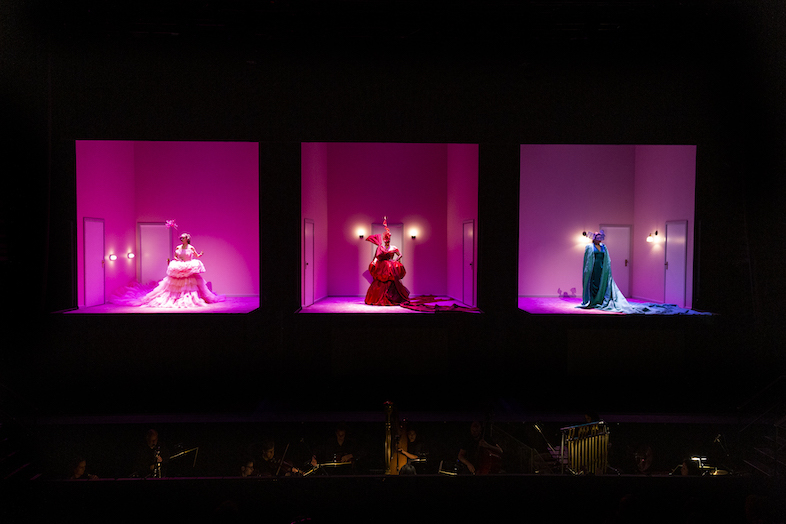 From an inky blackness, the curtain parts to reveal a striking vision of the three Sirens, with McGregor joined by sister divas Dimity Shepherd and Antoinette Halloran. The lovely music of the overture is soon joined by harmonic sighs from the singers and the work is underway. 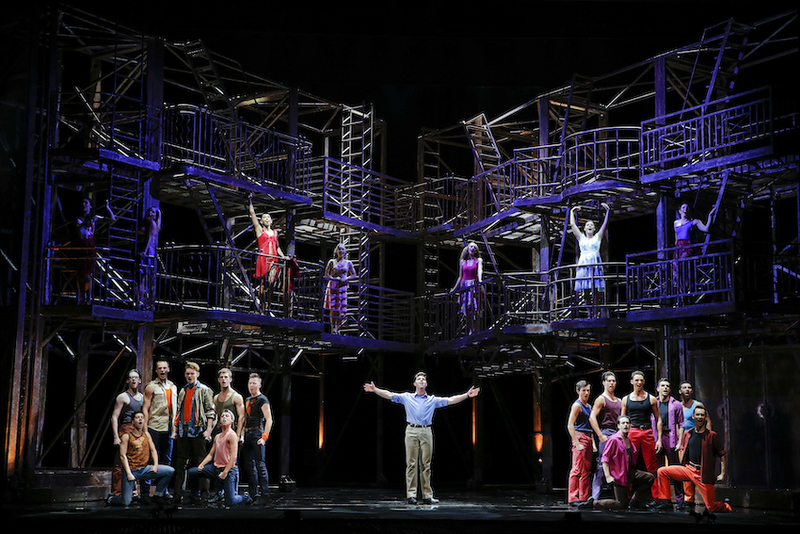 In an inspired staging concept, by Marg Horwell, a large construct places the three women at eye level of the raked auditorium, with surtitles subtitles displayed on crisp, carefully programmed LCD screens beneath each singer. 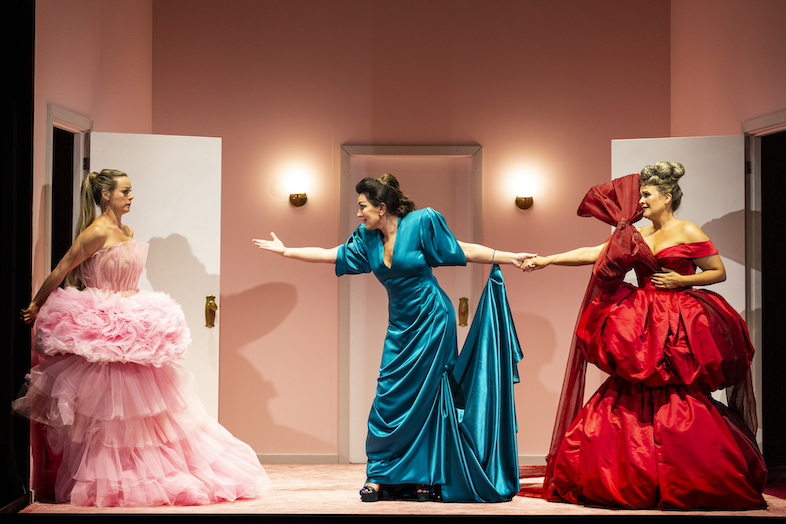 The women begin in their own room, eachthe picture of decadent glamour in extravagant gowns designed by Horwell, created by David Anderson and set off by millinery from the inimitable Phillip Rhodes. The glossy stage picture plays on audience expectations of women on stage, and it is not long at all before cracks start to show. Attempting to move, the women can only manage to shuffle in their high platform heels, acres of skirting and lavish trains. Initial sequences establish the women as Sirens and characterfully tell the backstory of the original Lorelei. 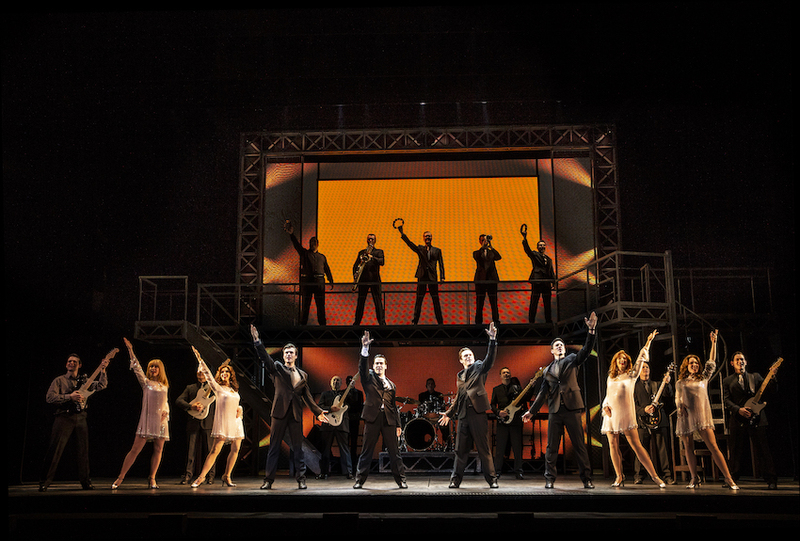 Just as the audience might be starting to feel they have the show pegged, it moves into a phase of deconstruction. Lorelei B suggests that, just for once, they might allow the current ship of sailors to pass through safely without being lured to their drowning deaths. Gradually peeling away their constrictive trappings, the women slowly allow themselves to relax, until the unthinkable happens and the ship crashes on the rocks anyway. Here, the show mines its prescient theme related to current gender issues. The women rail at whoever it was who originally cast them as the cause of tragedies, a role they never wanted. Director Sarah Giles, also acting as dramaturg, calibrates the timing of the journey with deft precision. The audience is held in rapt attention as the layers unfold, with the 75-minute running time flying by all too rapidly. In conjunction with the masterful work of Briggs, Giles melds each of the three individual performances into a compelling whole, and gives the surreal action an air of realism, as if the work is unfolding spontaneously before our eyes. In a particularly brilliant sequence, Lorelei A tries to leave the space but finds herself trapped in a mind-boggling maze, running through the slamming doors of a French farce. Helped back into their elaborate costumes near the end, the true tragedy appears to be that, for the meantime, nothing has really changed for women. Lighting designer Paul Jackson bathes the space in a luscious sea of liquid colour. Sound designer Jim Atkins achieves a natural quality for the subtly amplified vocals, neatly balancing the gorgeous harmonies. 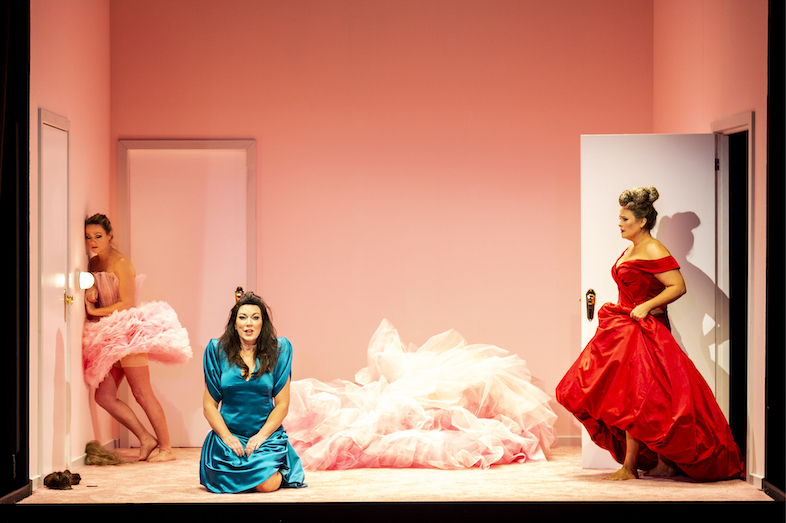 Each an attraction in their own right, McGregor, Shepherd and Halloran share the stage with grace and favour, shining in solo work and supporting each other as the Loreleis’ dilemma intensifies. Stripped to their undergarments, the women perform with unflinching courage. It seems that there is nothing that these goddesses cannot do, and their shared achievement here is a triumph that can only leave the audience wanting more. An absolute treat for the eyes and ears, Lorelei is sophisticated adult entertainment of the highest order. Lorelei plays at Merlyn Theatre, The Coopers Malthouse, Melbourne until 10 November 2018. The Lorelei program can be read online. this looks fantastic one could only hope it could tour our major cities at least! Hopefully Lorelei will be seen again. So much work in the writing and the staging. And such talent on stage!